Traditions are something most of us are all too familiar with during the holiday season. Whether it’s a new tradition started in recent years past or an old tradition that’s been around for generations, they’re something we look forward to and expect to always be present come Christmastime. A tradition in my family which I’m sure I’ve discussed before is homemade raviolis. It takes a team to make them a few weeks before Christmas and they never seem to last long enough once ready to eat. Making over 200 raviolis isn’t a task for everyone though. 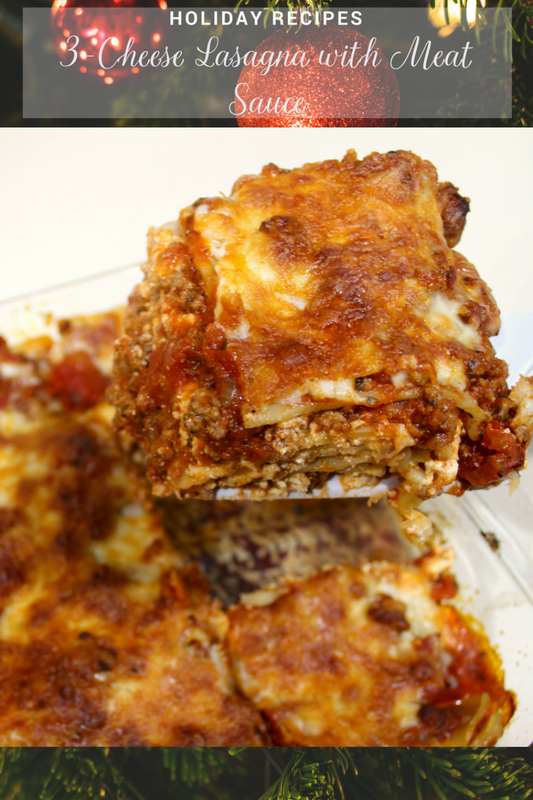 For an equally hearty, and maybe even tastier Christmas dinner, try this lasagna recipe. While I love quick meals, this is not one of them. 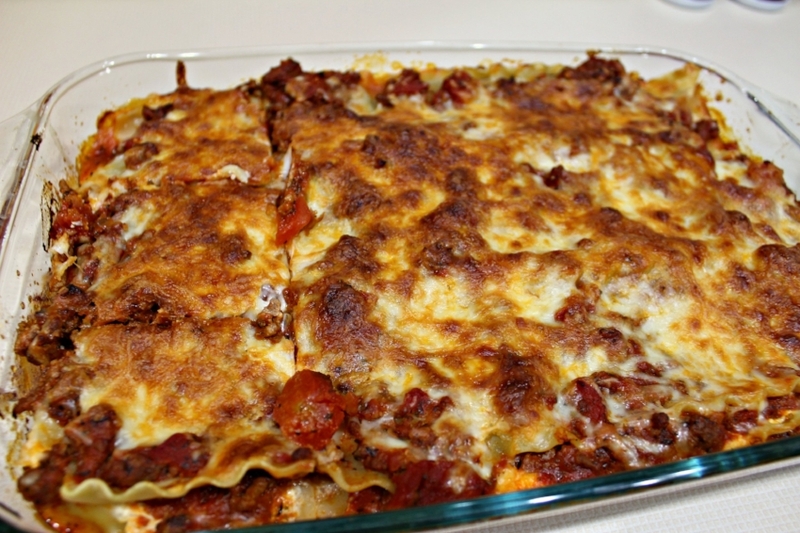 The lasagna alone takes a hot minute to prepare and the meat sauce needs a few hours. My advice? Cook the sauce in advance. To be honest, make this whole thing in advance. When we were talking about Christmas this year, there were a few days where raviolis weren’t part of the plan and lasagna was going to be the star of the show. My plan was to make the meat sauce and assemble the lasagna about a week or so in advance. It would freeze, thaw out 24 hours in the fridge and then Christmas Day, all it would need was to bake in the oven. So while lasagna seems like a laborious dish during a busy holiday, it’s actually a life saver if you prep it in advance. Let’s talk sauce. First of all, I want you all to know how uncomfortable it is for me to type out sauce. I grew up calling it gravy which some of you may be familiar with and others may be thinking I’m crazy. When I hear it in my head as I’m typing, it doesn’t sound right. Like I’m using a bad word almost. Anyway, the trick to any great homemade sauce is time. The longer it simmers on low, the deeper the flavors become. Two to three hours is a decent amount of time but if you have five or six, even better! You can use tomato sauce or Passata as your base. Passata is tomato puree. I’ve only seen jars from Italy but any will do. The main difference between Passata and tomato sauce is that sometimes your tomato sauce can have extra pureed ingredients. Passata ensures a pure tomato flavor. Now, let’s talk lasagna. I have a bone to pick with the instant lasagna noodles. You know? The ones that you put in the baking dish without boiling. It never works! They end up crunchy and underdone and it ruins the entire dish. I swear by the traditional lasagna noodles you boil in a pot before assembling. The result is always a million times better. The trick is to under cook them a bit. You want them to have a significant bite because they will soak up some of the liquid from the sauce and the steam that releases. If the top is cooking a little too quick, cover your baking dish with tin foil. It will ensure the lasagna cooks even without the top turning into a burnt crisp. Tell me in the comments below, what will you be making for Christmas this year? 1 - Make the Meat Sauce: In a large pot, brown the meat over medium-high heat. Remove the meat to a paper towel lined plate to drain the grease. Back in the pot, heat the olive oil and butter. Add the onions and garlic and cook about 5 minutes until softened. Add the remaining ingredients along with the cooked meat, salt and pepper to taste. Bring to a boil and let simmer for 2-3 hours on a very low heat. Reserve 8 cups for the lasagna or portion out into 2 cup portions. Freeze for up to 3 months. 2 - Prep the Lasagna: Preheat the oven to 400 degrees. Grease a 9*13 inch baking dish with a light coating of olive oil. 3 - Mix together the ricotta, eggs and parmesan in a bowl. Set aside. A - Spread a cup of the meat sauce on the bottom of the dish. B - Layer three noodles, length-wise, on top of the sauce. C - Spoon a third of the ricotta mixture onto the noodles. D - Gently lay another ½ cup of the sauce onto the cheese, being careful not to mix the two. E - Repeat for two more layers. F - On top of the final noodle layer, spoon the remaining sauce, making sure it drizzle down the sides of the dish and sprinkle with the mozzarella cheese. 5 - Bake 25-30 minutes until the cheese on top is bubbly and starting to brown around the edges. Let the lasagna rest for at least 15 minutes before serving.